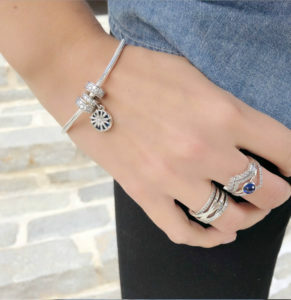 The holiday season is drawing near and it is our favorite time of the year- the release of the Pandora winter collections! 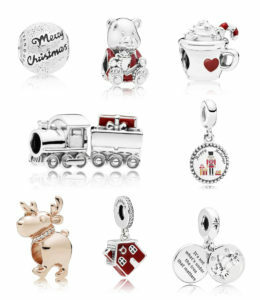 This year has some gorgeous new jewelry additions, heartwarming charms, and tons of fun for the Disney lover. Check out our review of all the new pieces below! This year’s holiday collection includes charms for a wide range of tastes and budgets. The charms and jewelry fall into two main themes: Christmas in Space, offering whimsical celestial-themed pieces and bringing the sparkle with dazzling baguette cuts, and the Traditional Christmas charms we all love. 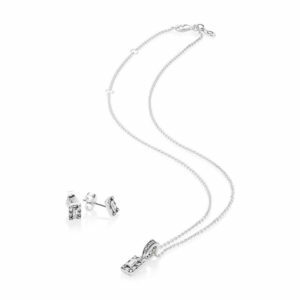 For the sparkle lover, the charms of the Christmas in Space collection mimic shards of ice with baguette cut cubic zirconia in scattered formations. 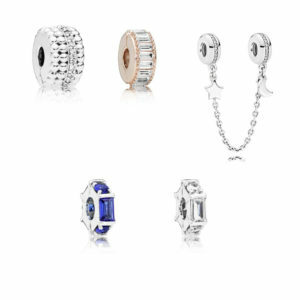 We love the new chiseled elegance charms ($75) and Ice Sculpture spacers ($45), both available in clear or midnight blue. 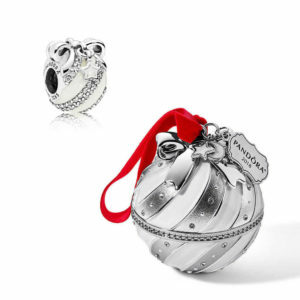 Two of our other favorite charms, the Dazzling Wishes ($65) dangle and Pavé Sphere button-style charm ($75) are available both by themselves and in some of gift set offerings this year. 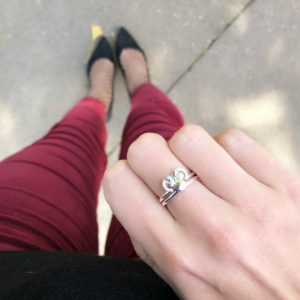 The Dazzling Wishes charm, depicting a firework bursting in the sky, is engraved with “The Best is Yet to Come” on the reverse and makes a great pairing with the Dazzling Fireworks charm ($65). In keeping with the icy theme, the Ice Carving dangle ($55) is engraved with “You Melt My Heart” with an overhanging icy wreath. Two well-received styles have been updated with new colors- the Sparkling Love heart charm ($75), which made its debut in the fall, is now available in midnight blue and the Dazzling Snowflake ($90) now comes in Cerise red as well. The more whimsical part of the Christmas in Space theme celebrates the arrival of some new Pandora Friends. 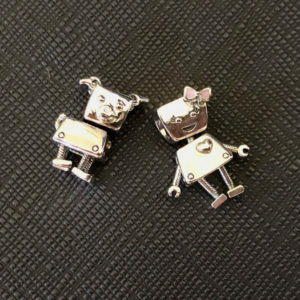 Bella Bot, now also available in the Pandora Shine finish ($100), is joined by her faithful companion Bobby Bot ($60). We love his moveable flap ears! 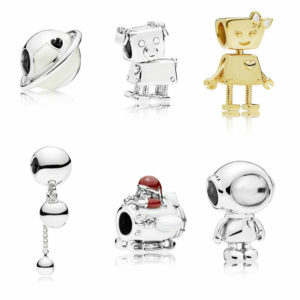 Cosmo Tommy ($75) has also joined the Pandora Friends, adding a touch of adventure to this collectible bunch. 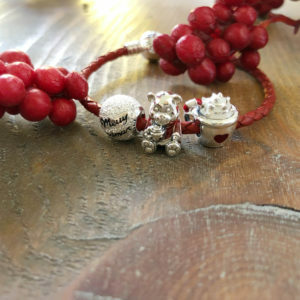 The Planet of Love charm ($55) is a limited edition piece only available during this holiday season. For those days when the reindeers need a break, Santa can be seen cruising about in his rocket ship in the Santa in Space charm ($50). The String of Beads dangle charm ($50) is part of the Purely Pandora collection, but also fits well with these fun planetary additions. In addition to the Ice Sculpture spacers, two new clips, the Beaded Brilliance ($45) in silver and Ice Formation ($55) in Pandora rose, have been added to the collection. The Personal Galaxy safety chain ($65) helps ensure that your bracelet is secure while you look up at the stars. The Traditional Christmas charms this year focus on warmth and family and are accented with a beautiful berry red and white enamel. 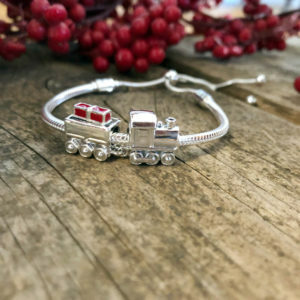 We love the new Christmas Train charm ($75)- it comes in two connected parts! Another one of our favorites this year is the Warm Cocoa charm ($45)- how adorable is the candy cane sticking out of the whipped cream! 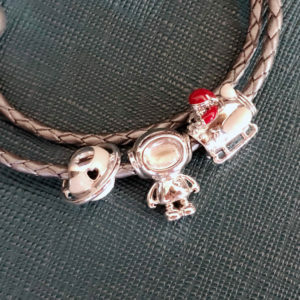 Take a close look at the Christmas Bear charm ($45) to see Pandora’s intense detail- he is holding the same cup of warm cocoa in his hand. 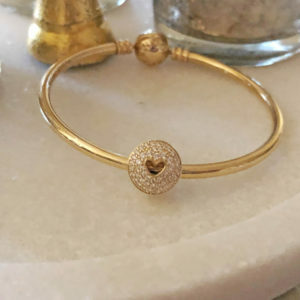 We also love the Merry Christmas charm ($40) as a way to celebrate the season for those who have a more neutral-colored bracelet. 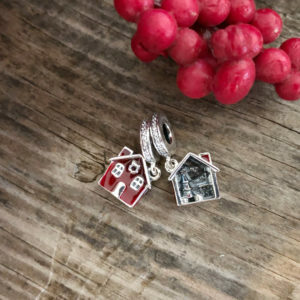 Another staff favorite this year is the Cozy Christmas House dangle charm ($55). From the front it is a festive red house. Turn it around to take a peek inside the home at all of the Christmas decorations. In addition to the sterling silver and Pandora Rose charms, two new 14k yellow gold charms have been added in this year’s holiday collection. The Heart of Luxury clip ($450) has beautiful pavé accents and a cut-out heart at the center. The Glowing with Love charm ($350) features cut-out hearts with the word “Love” in script at the center. Like this year’s charms, the holiday collection jewelry can be grouped in two main themes: Purely Pandora, focusing on a minimalist look in smooth silver, and Luminous Ice, featuring the same baguette-cut CZs that added an icy look to many of the charms. 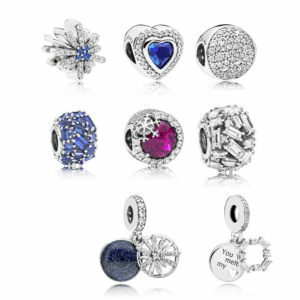 We love the simple aesthetic of the Purely Pandora pieces. 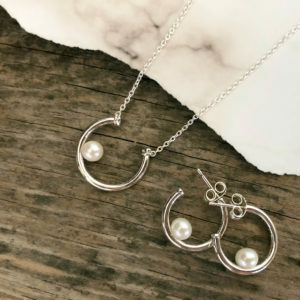 The Contemporary Pearl necklace ($90) and Hoop Earrings ($90) would make a great set for the girl who likes a streamlined look that focuses on the beauty of shining sterling. The Luminous Ice pieces are perfect for the girl who likes a little sparkle in her life. 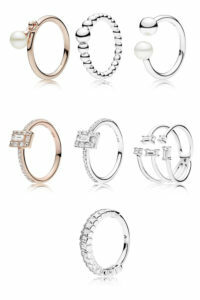 The Glacial Beauty Drop earrings ($90) are gorgeous in person and show off the on-trend forward facing hoop style. 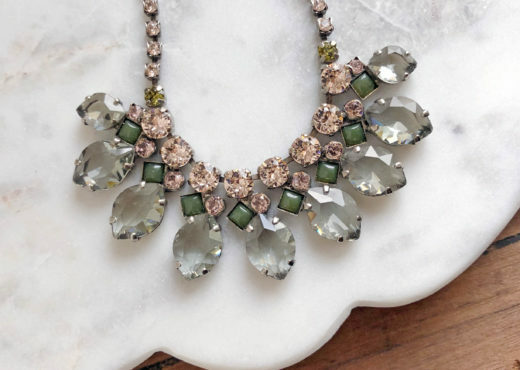 The Shards of Sparkle necklace ($125) is a beautiful companion piece that would make anyone’s holiday merry and bright. 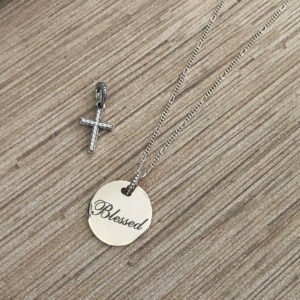 The necklaces category also sees the addition of a new Cross Pendant ($60) with a sparkling tapered bale and an engraved necklace with the script engraving “Blessed” ($75). The Luminous Ice pendants, available in silver ($65) and Pandora Rose ($75), offer a petite flash of sparkle. 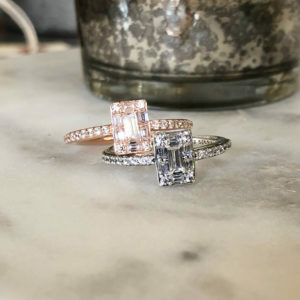 The Luminous Ice collection also includes a beautiful interpretation in the rings available in both the sterling silver ($75) and Pandora Rose ($100) finishes. The Glacial Beauty ring ($100) is a new stackable design that complements the Luminous Ice collection with a row of baguette cut CZ stones. Other additions to the ring collection include the Contemporary Pearl ring in Pandora Rose ($90), String of Beads Ring ($50), Contemporary Pearl cuff ring ($65), and Shards of Sparkle ring ($75). Some of our favorite pieces in this year’s holiday jewelry are in the earrings category. 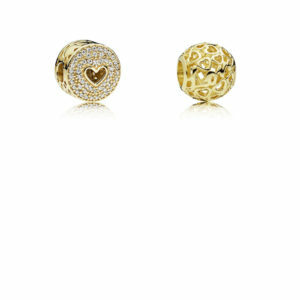 We love the Lunar Light stud earrings ($50) and Luminous Ice stud earrings ($60) for a touch of everyday sparkle. The Glacial Beauty drop earrings are a gorgeous statement piece ($90). From the Purely Pandora collection, the Contemporary Pearl Hoops in silver ($90) and Pandora Rose ($115) add a modern twist to an old standard. The Classic Beads stud earrings ($45) and String of Beads hoop earrings ($50) continue the smooth beaded design. 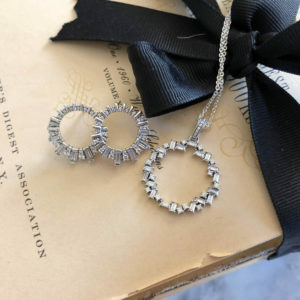 One of the most innovative earring designs is the String of Beads dangle earrings ($65), which can be pulled to change the length of the dangling beads. 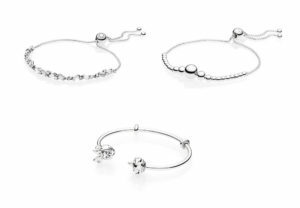 Pandora has also added two new sliding bracelet designs this year. 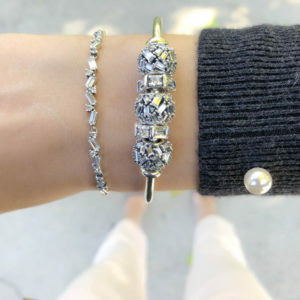 The String of Beads bracelet from the Purely Pandora collection ($65) features graduated beads in bright sterling silver. 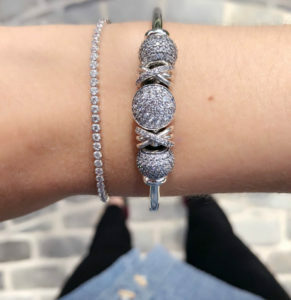 The Glacial Beauty sliding bracelet ($100) is a stunning sparkling piece with scattered baguette cut CZs. 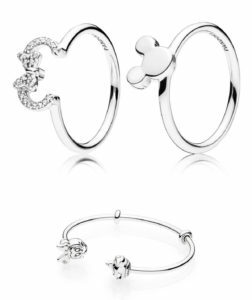 The open bangle also has a new design for Disney lovers- the end caps are cute Mickey and Minnie portraits ($125). This year’s Disney additions focus on classic Mickey and holiday celebrations. There are also some new charms to showcase the Mary Poppins Returns movie coming out this year! Mickey and Minnie’s sparkling portraits are now available as clips ($90), which look great as stationary pieces on a bangle or leather bracelet. The Steamboat Willie ($65) portrait charm is part of the celebration of Mickey’s origins and the Sorcerer Mickey ($65) dangle charm honors one of his most famous roles. 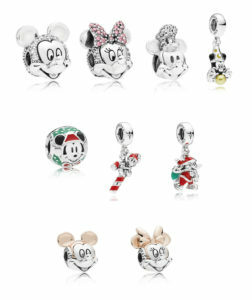 We love that this year’s Disney additions include some overtly Christmas beads, including the Santa Mickey charm ($65), Santa Mickey’s Candy Cane dangle ($65), and Santa Mickey & Gift Bag dangle ($65). Disney has also expanded into the Essence collection with the two-tone silver and Pandora Rose Mickey and Minnie portrait charms ($50). 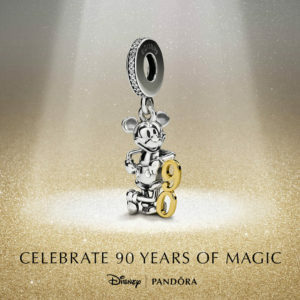 This year’s Limited Edition charm ($100) celebrates Mickey’s 90th birthday. Packaged in a special box, it shows mickey leaning against a golden “90”- he looks good for his age! 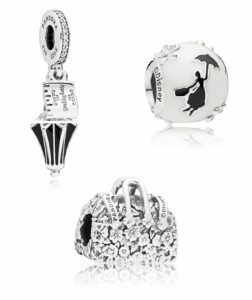 For those anxiously awaiting the new Mary Poppins movie, these three charms are a delight! We love Mary Poppins’ bag ($50), which is covered in flowers and bears her name on the bottom. The Mary Poppins Silhouette charm is distinctive in bright enamel colors ($65) and the Umbrella dangle ($70) focuses on one of her iconic symbols. We also love the new Mickey and Minnie nesting rings! The sparkling Minnie silhouette and bow ($65) fits above the Minnie silhouette ($50). One of the highlights of the Pandora holiday collection is always their beautiful gift sets. This year’s additions include two bracelet gift sets, a jewelry gift set, and this year’s Limited Edition 2018 charm. 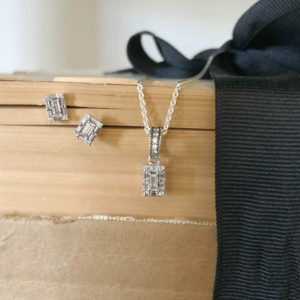 The Luminous Ice jewelry gift set ($140) includes the Luminous Ice pendant and earrings and a 45cm sterling silver chain, for a savings of $25. 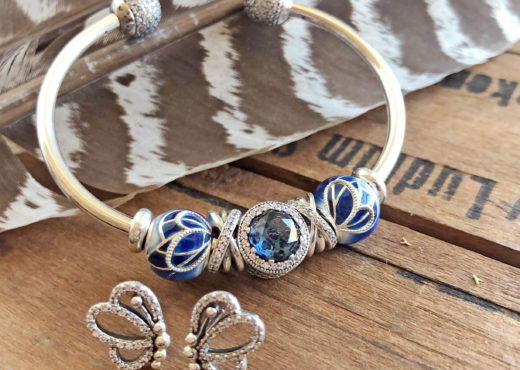 The Dazzling Wishes gift set includes the Pandora Smooth bracelet, Dazzling Wishes dangle charm, and two Shining Elegance clips. At $179 it offers a savings of $66. 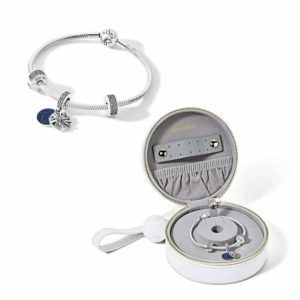 The set is presented in a beautiful white leatherette travel box with room for your bracelet, earrings, and necklaces. Our favorite set is the Wintry Holiday Open Bangle set, which includes the open bangle and the new Pavé Sphere charm. At $129 it offers a savings of $26. We love the look of the set finished off with two galaxy spacers and pavé lights charms! Following last year’s collaboration, this year’s Limited Edition charm is also presented in conjunction with the New York Radio City Music Hall’s Rockettes. The charm is decorated with glistening white enamel and a small star and moon dangle at the top. 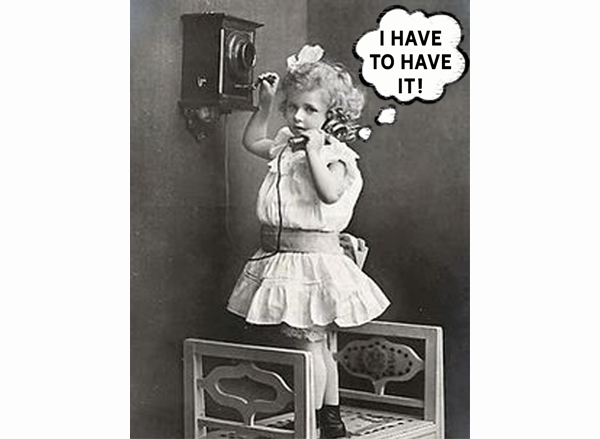 It is presented in a larger replica of the ornament that you can hang on your tree! We love the sparkle of this year’s holiday charms and jewelry. 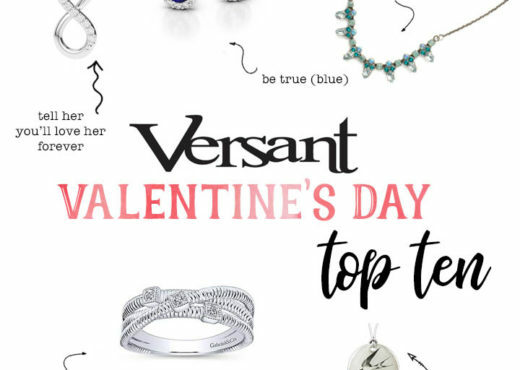 Stop by Versant to see all of the new pieces in person!